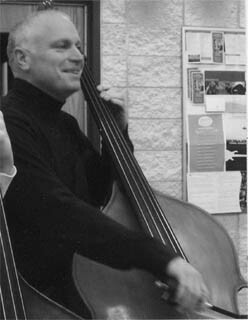 Jed graduated from the University of Michigan in 1985 with a Master's degree in double bass performance. He has been a member of the Toledo Symphony, the Ann Arbor Symphony, the Meadowbrook Festival Orchestra, the Northwood Symphony, the Flint Symphony, the South Dakota Symphony, and the Waukesha Symphony. He has also performed with the Doc Walker Jazz Quartet, the Saline Big Band and various polka, country, rock and folk bands throughout the country. Jed is currently the Orchestra Director at Chelsea High School. He returned to Chelsea in 1995, after six years in Wisconsin and Minnesota. He previously directed the Chelsea string program from 1985-1989, during which time he grew the program from 59 to 130 musicians. At the present time, there are about 100 string players at the High School and 380 students enrolled in strings grades 5-12. Jed's most recent innovation is a Celtic music ensemble called the Chelsea House Orchestra, founded in 1998. This group, which includes violins, violas, cellos, guitar, bass guitar, harp, flute, oboe, djembe, bodhran, and various percussion instruments, has recorded two compact disks. Jed was the founding artistic director of the Wisconsin American String Teachers' Elementary String Camp. In Minnesota, he founded an eclectic music ensemble called "The Morning Show" performing a variety of folk, jazz and classical music. Jed has presented workshops at the Midwest Convention in Ann Arbor, Michigan three times; at the Kentucky Music Educators symposium; as part of the Minnesota All-State teacher training program. He has conducted festival orchestras in Minnesota, Kentucky, South Dakota and Wisconsin.